For any kind of measurement it’s imperative for manufacturers to know the amount of parts produced by the equipment. Now that the customer knew about the state of the production resources at a given point in time this requirement waited for a solution. One part - multiple work steps: Here the machine subsequently performs and completes all steps of an operation for a single work piece. This may include changing tools within the operation. As soon as the cycle has finished one part is output. One tool - multiple parts: Here the machine operates on multiple work pieces at the same time and performs a part of the operation with a specific tool on all mounted pieces. After changing the tool the device repeats the procedure. As soon as all steps of the operation have been executed on all parts a specified number of parts has been output. 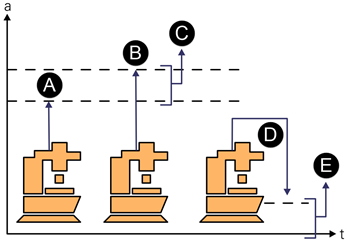 One work step - multiple parts: The manufacturing device performs a single task on multiple work pieces at the same time. As soon as the operation is finished a defined number of parts is output. As the project team knew that the majority of PLC and CNC controlled machines has an internal part counter (F) which stores the total number of cycles executed by the device it should be possible to read and use this value in the same way as with machine-states. The querying service then simply would have to subtract the value received in the last reading cycle (A) from the actual one (B) and report the difference (C). In case of a ‘one tool - multiple parts’ or ‘one work step - multiple parts’ manufacturing technique the result would have to be multiplied by the number of parts mounted at the clamping device. Unfortunately in reality it isn’t that simple... Although the part counter values are increased and stored with every cycle completed it is possible to reset them to zero, either by pushing a reset button or clearing out the value at the operator panel. In case the data acquisition solution now would calculate the difference between the last read (B) and the current value (D) the result would be negative. This simply isn’t correct and would lead to unpredictable results. To resolve this potential issue the data acquisition service was equipped with additional logic that is able to detect reset operations (previously read value is higher than actual value) and calculate the increment of the output (E) correctly by taking the reset into account. 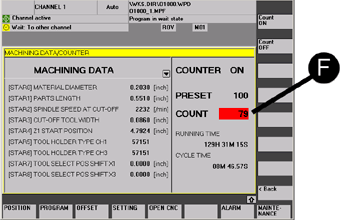 Although PC controlled devices such as Laser Markers and Molding machines usually do not have this built in part counter it was possible to again use CNCnetPDM’s log file analyzing functionality to accomplish this task. As for the other machine types the data acquisition service internally maintains an own part counter for every machine. In addition to finding out the ‘mutually exclusive machine state’ the service was equipped with logic that searches the log file for entries that indicate part output since the last reading cycle. If more than one entry is found the service sums up the number of parts produced before sending the value to the machine’s part counter at the server. Fortunately no reset detection functionality was needed for this type of machines.